Abstract: Airwheel mini electric scooter is popular among all age groups. Lately, the H3S automatic electric wheelchair was born and its automatic folding system and intelligent handlebar controller are well received by the old. It transforms the lives of the individuals. Airwheel smart electric scooter pays attention to many humanized design details which make popular among all age groups. Airwheel R&D team is always diligent and tries its best to explore more user-friendly elements. Airwheel has broken the standing electric scooter tradition and introduces brand-new sitting-posture riding mode to offer people a stable and comfortable riding. H3S motorized wheelchair is such model designed for the aged. Power wheelchair markets at $1.5 billion in 2015 are anticipated to reach $2.4 billion in 2022. Market growth comes in large part from demand for mobility from people who might otherwise be bedridden. The aging of the population is creating a growing pool of people that need power wheelchairs. Airwheel H3S electric wheelchair is equipped with aluminum alloy frame that is harder, lighter, more durable and stylish. It can be put in the trunk easily, as it initiates automatic folding system. That is, riders can fold up by pressing the fold/unfold button on the joystick controller. 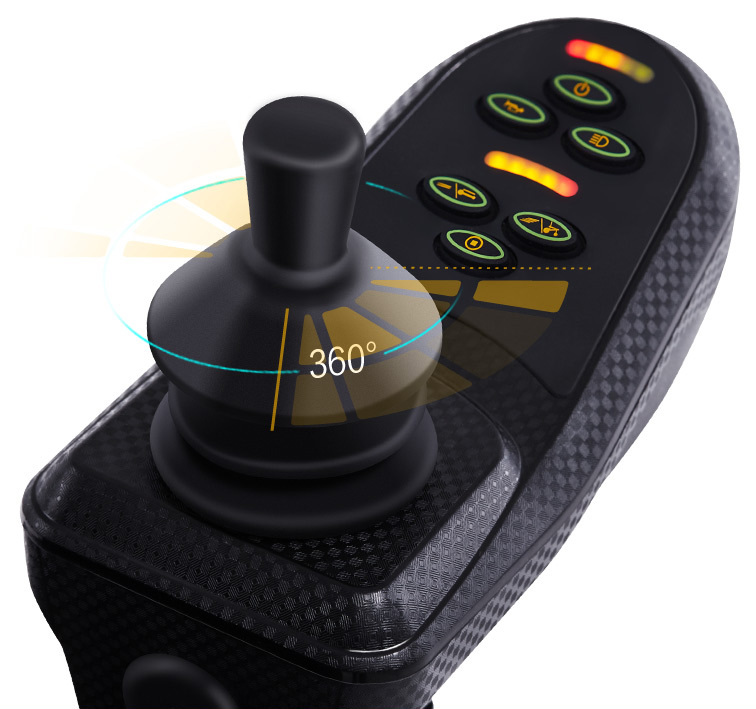 Speaking of the joystick controller, it is mini and flexible and realizes all the commands, like speeding up and turning directions. It will automatically brake when your hand doesn't touch the controller, which is super easy to control. It accords with the riding habit and they aim at saving space. What is more, H3S electric folding wheelchair's headlight under the joystick controller lightens the light-insufficient environment to ensure a safe ride at night. H3S's pedals have frosted surface, with three adjustable heights so that more riders will enjoy it. Its saddle with double honeycomb mesh breathable material, is wear-proof and durable. The longer you sit, the more comfortable you feel. There is a storage box in the back and riders can prepare some daily necessities. In addition, the custom-made app for Airwheel H3S smart chair is one of the most significant technological breakthroughs. Its smartphone app is able to clearly show real-time data. Also, riders can control it via app directly, such as power on/off. Three remote controls available. Previous：The Environmentally Conscious Airwheel R6 Trekking Bike Is the Ideal Transport for All of Your City Adventures.